Track the hours of the day with the sophisticated look of the Shinola Detroit® The Runwell Chronograph Titanium 47mm. Brushed stainless steel case with gunmetal PVD coating. Adjustable dark cognac leather strap with tonal stitching. Gunmetal sunray dial face with Arabic numerals, two subdials, minute track at perimeter, and brand name. 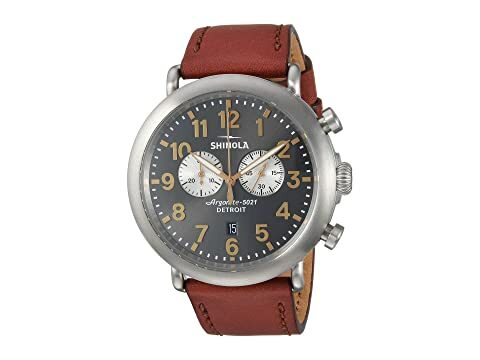 We can't currently find any similar items for the The Runwell Chronograph Titanium 47mm - 20109230 by Shinola Detroit. Sorry!